The Active Directory database tends to become fragmented over time, just like any other database does. 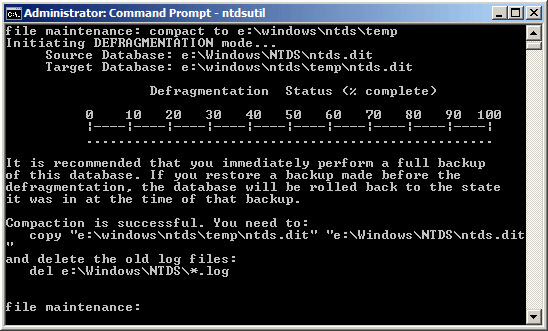 Although Windows Server 2008/2003/2000 performs behind-the-scenes online defragmentation periodically, this defragmentation only moves data around the database file (NTDS.DIT) and doesn’t reduce the file’s size – the ntds.dit database file cannot be compacted while Active Directory is online. If you have significantly fewer objects in AD than you had previously, you can shrink the size of the ntds.dit file by performing an offline defragmentation. Performing an offline defragmentation can increase performance, however, the main reason would normally be to free up disk space. Please note, you should backup your database before doing this by copying your ntds.dit to another location. How to Perform Active Directory Offline Defragmentation? First, you need to stop the Active Directory Domain Service. 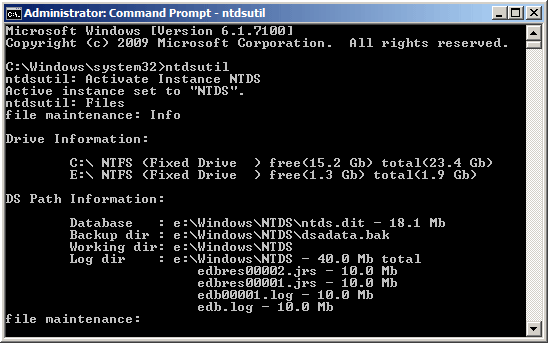 You can defrag / compact the ntds.dit database file when AD is not running. It’s not necessary to reboot into Directory Services Restore Mode. The command shown above assumes that you have created a folder named Temp beneath the e:\windows\ntds\temp folder. When the process completes, you need to do what it says and copy the defragged database from e:\windows\ntds\temp\ntds.dit to e:\windows\ntds\ntds.dit. Finally, restart the Active Directory Domain Services (the dependency services will restart automatically). You now have a smaller and better performing Active Directory. I’ve been tasked with resetting the passwords on all users (about 2000 users) in an OU in Active Directory. I was given the proper permissions. Is there any way to reset all the passwords to one single password at one time? 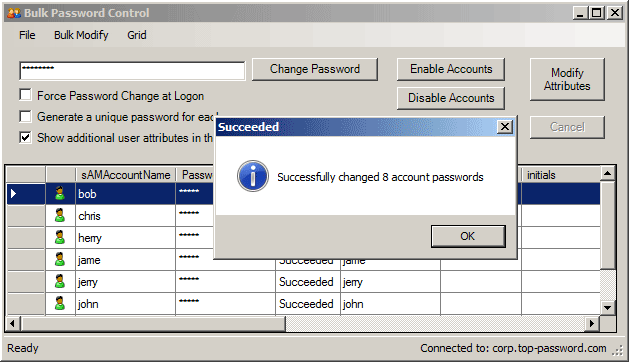 There may be times when you need to bulk reset user passwords in a domain or OU, or change account attributes across user groups, such as force all users in Active Directory to change their password at next login. This is the most common problem that many consultants or network/system administrators face. How can you perform these tasks in a short time? 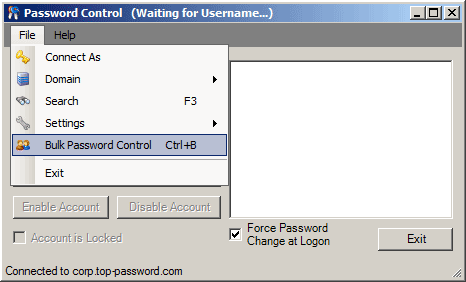 Password Control is a time-saver freeware that makes it easy for helpdesk staff to reset passwords for all Active Directory user accounts. The tool also enables you to unlock/disable/enable user accounts, updates Active Directory user account attributes, performs updates that previously would have been accomplished with scripts. 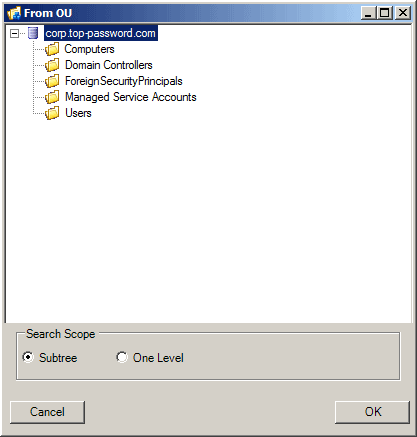 How to Bulk Change User Passwords and Account Attributes in Active Directory? Download and install Password Control on your domain controller. You can get the latest version from this link. Start Password Control. Click on the File menu and select Bulk Password Control. 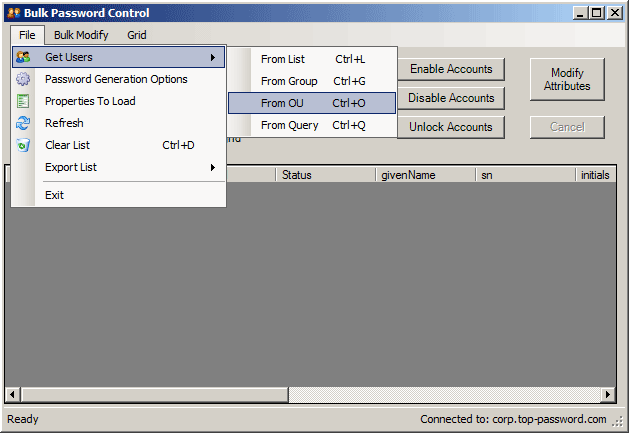 Under Bulk Password Control dialog, click on the File menu and select Get Users and From OU. The powerful searching interface allows you to select user accounts based on a variety of options. You can select users from a group or a particular organizational unit. If you want to reset the passwords of all user account to one single password, un-check the Generate a unique password for each user option, type your desired password. Click on the Change Password button. The program will change all your Active Directory user account passwords immediately. You can also click on the Unlock Accounts button to unlock the AD user which are locked out. By click on the Modify Attributes button, you can bulk change various account attributes such as Password never expires, User must change password at next logon, update of phone numbers and additional information, etc. Overall I was very impressed with the ease of use and functionality of Password Control. I know from experience that writing scripts to bulk change user passwords is quite complex and time consuming. This tool is very useful for system/network administrators to work with Active Directory. When Active Directory (AD) isn’t working, the steps you’d typically follow would be to boot into Directory Services Restore Mode (DSRM) for repairing or recovering Active Directory. To access Directory Services Restore Mode, you typically press F8 prior to the machine booting into Windows, then select the Directory Services Restore Mode option from the menu that appears. Tips: If you forgot DSRM password or domain admin password, you can reset the forgotten password easily with Reset Windows Password utility. But sometimes you need to fix a problematic DC in a remote location, but nobody is close enough to troubleshot. Obviously, you can’t boot the domain controller into DSRM as usual. In this tutorial we’ll show you how to access Directory Services Restore Mode on a remote DC. How to Access Directory Services Restore Mode on a Remote DC? On your machine, select Run from the Start menu, type Mstsc /console, and click OK. Type the IP address of the remote domain controller you want to connect to. Log on to the server using the Active Directory account. On the DC, right-click My Computer, click Properties, and then click the Advanced tab. Click Settings for startup and recovery. Click the Edit button to edit the startup options file. Save the modified Boot.ini file, and then close Notepad. After waiting a few minutes, perform steps 1 and 2 again. When you reconnect, the server should state that it’s in Directory Services Restore Mode. Log on using the Local Administrator account (not the Active Directory account). Once you have restarted the server in Directory Services Restore Mode, you are ready to begin the repairing or recovery process.